Usain Bolt's record breaking 150 metres run was recorded in 3D by Sky, as the company continues to push ahead with its plans for bringing an extra dimension to our viewing. 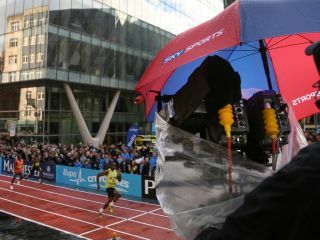 Bolt, the fastest man on earth, raced the unusual 150 metre race in Manchester on a specially designed track in Deansgate – and his 14.35-second time is a world best, although not a world record because the distance is not officially recognised by the IAAF. However, the remarkable run was tracked the entire way by five Sky 3D rigs – one of which was mounted on a rail alongside the track, the first time this has ever been done. Take 10 cameras into the shower? Each of the 3D rigs contains two HD cameras, and the footage that they captured will be shown at Odeon cinemas later in the year. "It's great for Sky to be involved in capturing another compelling piece of content in 3D, to add to the catalogue of events we've recorded so far – from Ricky Hatton's Manchester Homecoming fight last May to a live 3D broadcast of Keane last month, and even the UK's first 3D ballet," said Brian Lenz, Sky's Head of Product Design and Innovation. "As part of our on-going research and development work, we're continuing to assess how 3D can work across a range of events and programming genres." Sky's commitment to 3D is increasingly apparent – with the broadcasters once more investing in the technology and, presumably, learning the lessons in just how to get the most out of filming in 3D.